Peterborough United manager Grant McCann’s rallying call ahead of the League One fixture with MK Dons at the ABAX Stadium tomorrow (January 28) included a plea for bravery and risk-taking. McCann admits the performance in defeat at Oldham on Tuesday (January 24) hurt him so badly he spent that night at the training ground planning the best way to generate some much-needed improvement. He labelled the display at Boundary Park ‘disgusting’. Posh skipper Chris Forrester in action during the Oldham debacle. It’s the first home game of 2017 - after five successive away matches - for Posh against a team who have become fierce rivals in recent seasons. The match is also a designated ‘Chris Turner’ day and a concerted fund-raising effort for the club legend’s planned statue will be held. 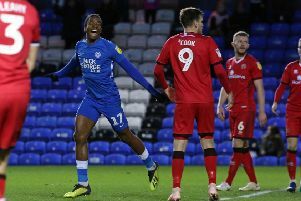 The defeat at Oldham - and a run of one win in six League One matches - has left Posh in eighth place, four points off the play-off positions. “It might seem a strange thing to say, but I’m not bothered about clean sheets,” McCann stated. “I’m not a manager who wants to watch his team defend and hope to sneak a goal on the breakaway. If you want a big money move away from Posh, start playing like Aaron Mclean. “I want my players to take risks. I want my players to be brave on the pitch. I don’t want my players to worry if they lose the ball, I just want them to concentrate on getting it back again. I want them to go foward and play attacking, entertaining football. “It’s the only way to get the fans out of their seats. Excite the fans here and it’s a great place to play. We’re certainly looking forward to playing in blue again as it seems a long time since we played at the ABAX. “I didn’t recognise my team at Oldham. We were static. We hardly created a chance. “That defeat hit me hard, harder than any other result this season and I ended up sleeping at the training ground as I was trying to work out what to say to the players to pick them up. “Some people might not realise it, but the players are hurt by performances like the one at Oldham. They have points to prove and I expect to see another reaction from them. “I’ve told them there is nothing better in football than being part of a winning team, one that unites to gain success. We will stick together even if two of the last three matches have been a big disappointment. “We are still only four points from the play-offs and we have 19 games to go. We will need to win 11 of them as 74 points normally gets you in the play-offs. “League One is relentless. Games come thick and fast and they are all tough. “We’ve had some great battles with MK over the years. I’ve played in some of them and they will come here in good form under a new manager. McCann admitted Posh were close to making a signing and the new man could arrive in time to play against MK Dons. Posh are known to be seeking a new striker, but according to McCann it won’t be former ABAX favourite Conor Washington. McCann also had a message for any of his players expecting to leave the club before the transfer window shuts on January 31. “Players have to win things for this club before they leave it,” McCann added. Posh have a couple of unnamed injury doubts for tomorrow.